Kristian Teleki, Vice President for Science Initiatives for SeaWeb and former Director of the International Coral Reef Action Network (ICRAN), spoke with Laurel Neme on her "The WildLife" radio show and podcast about the biology of corals, threats to coral reefs, and what can be done to halt their decline. This interview originally aired May 3, 2010. The interview was transcribed by Diane Hannigan. Coral reefs are often considered the "rainforests of the sea" because of their amazing biodiversity. In fact, coral reefs are one of the most diverse ecosystems on earth. It is not unusual for a reef to have several hundred species of snails, sixty species of corals, and several hundred species of fish. While they comprise under 1% of the world’s ocean surface, one-quarter of all marine species call coral reefs their home. Fish, mollusks, sea stars, sea urchins, and more depend on this important ecosystem, and humans do too. Coral reefs supply important goods and services–from shoreline protection to tourism and fisheries–which by some estimates are worth $375 billion a year. While people often think of coral as plants or rocks, in fact coral polyps are tiny, soft-bodied invertebrates related to sea anemones and jellyfish. These polyps create exoskeletons that aggregate and connect to one another to form coral reefs. These reefs are under threat from numerous fronts: ocean acidification, climate change, destructive fishing practices, pollution, sedimentation, and coastal development. As Teleki notes, the problem is that "we know more about outer space than we do about out own ocean." Kristian Teleki joined SeaWeb as Vice President for Science Initiatives in November 2009. For the decade before that, he served as the Director of the International Coral Reef Action Network (ICRAN), a unique global partnership dedicated to addressing the serious decline in the health of the world's coral reefs. During his tenure Kristian had oversight for more than 40 coral reef projects in 35 countries. Project activities ranged from livelihood diversification and resource management to the prevention and mitigation of ecological degradation of coral reefs through management, monitoring and public awareness actions. In addition to his ICRAN duties, Kristian established and led the One Ocean Program at the United Nations Environment Program's World Conservation Monitoring Centre, designed to reflect the interconnected nature of the world's seas and its coastlines, the rich and varied biodiversity they support, and human reliance on its resources and services. Kristian Teleki has a diverse background in marine science and conservation, and his field experience extends from the polar to tropical environments. He is particularly interested in the relationship that humans have with the ocean and promoting the sustainable use of its resources. He has degrees from the University of California, Santa Barbara, and Cambridge University. He also is on the Editorial Board of Aquatic Conservation, is a member of the Resource Users Group for the European Project on Ocean Acidification (EPOCA) and is a Steering Committee member of the Global Islands Partnership and the Global Forum on Oceans, Coasts, and Islands. The following is an excerpt from The WildLife with Laurel Neme, a program that probes the mysteries of the animal world through interviews with scientists and other wildlife investigators. The WildLife airs every Monday from 1-2 pm Eastern Standard Time on WOMM-LP, 105.9 FM in Burlington, Vermont. You can livestream it at www.theradiator.org or download the podcast from iTunes, www.laurelneme.com, or http://laurelneme.podbean.com. This interview originally aired May 3, 2010. The interview was transcribed by Diane Hannigan. Laurel Neme: What first got you interested in coral reefs? Kristian Teleki: It actually goes back quite a ways. In 1974, my parents and grandparents took us all down to the Bay Islands in Honduras. I was a young boy at the time, never having seen a coral reef before, and my parents gave me a mask. Looking underwater I just couldn’t believe the life that was under there! Coming from Canada, where most of the lakes are pretty murky and not being about to see anything, to warm waters of the Caribbean, beautiful fish, wonderful creatures all around. I think from that point on I was just fascinated by this ecosystem. I couldn’t believe something like that could exist. As I got older I made sure that we went back and forth to see coral reefs, and I think just after I left high school I realized that for me this was exactly what I wanted to do. I spent another semester down in the Virgin Islands before I started university, and I just fell in love. I wanted to do something about these reefs. At the time there were already some significant changes going on in the Caribbean. I felt like something needed to be done about it and decided to commit my last 25-30 years doing something about it. Laurel Neme: What kind of changes were you seeing in your travels? Kristian Teleki: To give you a good example, in the Caribbean, up until the early 1980s, the dominant herbivore was the long-spined, black sea urchin. Anyone who has been in the Caribbean knows what a sea urchin looks like. They have long, black spines and these things were covering the reef, and they were keeping the plants and algae at bay. In 1982 or 1983, there was a disease that went through that everyone thinks was introduced through the Panama Canal. [It] wiped out nearly the entire population of the long-spined black sea urchin in the Caribbean. So suddenly, it had caused a major shift in the balance of the ecosystem. Whether it was introduced by a human contaminant from a bilge from a boat into the Panama Canal, no one is certain. But, it was the start of a downward trend. If you think about a place like Jamaica, where at one stage there was 80% coral coverage, over about a ten-year period all its sea urchins died off, it had a couple of big hurricane events, and [experienced] overfishing of the other dominant herbivore, the parrotfish. Suddenly, [there was] a major switch from luxurious, beautiful coral reefs to 80% algae and 20% coral cover. This was a major change and really got people thinking about how we can have an effect on the ecosystem. There are some positive stories. I don’t want to paint a negative picture but it got a lot of coral reef scientists worried about, what we call, a phase shift. What I mean by that is that there is a complete flip of the ecosystem away from it being coral dominated to algae dominated. Algae grow much faster than coral reefs. If you think about it, your average coral reef probably grows about the rate your fingernails grow—some slower, some a little bit faster. If you think about that, they’re not growing fast and plants can obviously grow faster and out compete the coral. If you’re changing the system in any way, if you’re adding pollutants, it’s giving a competitive advantage to other organisms that out-grow these corals. Laurel Neme: Tell me a little bit about corals. A lot of people think they’re plants, but they’re invertebrates. Can you tell me more about them? Kristian Teleki: Coral reefs are really interesting. There are a lot of languages in the world that don’t have a word for coral reefs. Is it a living rock? Is it a plant? Is it an animal? It’s often very difficult to describe it in another language. 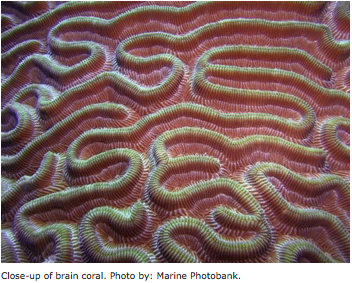 Basically, coral is what we call a symbiotic organism. It is a colonial animal; it has lots of individuals that come together to form an animal. Within the tissue of this animal live tiny little plants called zooxanthellae. When anyone sticks their head under water and sees the color of the coral reef, it’s the pigment, the coloration within these little, tiny algae, the zooxanthellae, that live within the tissues that give it its vibrant color. This algae plays a really important role in taking up carbon, and allowing carbon to be taken in by this animal. It can then secrete this calcium carbonate structure, which is its hard skeleton. [The algae are] photosynthesizing and providing carbon and nutrients to the coral to allow it to grow. The coral also has polyps, tiny little tentacles that can feed from plankton in the water. If you get all these polyps growing together, you get different shapes and different sizes. They then form an individual coral. When you add all these bits together, you get what we call a coral reef. It’s this three-dimensional structure, with cracks and crevices, that provides amazing habitat for fish. In fact, 25% of all marine species live in and around coral reefs—that’s all the mollusks, echinoderms, sponges, clams, oysters, starfish, all these sorts of things. You can see these are important organisms. When you think about the total surface area – and there is lots of debate amongst scientists about where a coral reef begins and where it ends – but if you take a rough estimate, coral reefs occupy less than 1% of the world’s ocean surface. People equate that to about half the area of France. Here is an ecosystem that covers a small part of the world but provides a mega-diverse ecosystem and provides an amazing amount of ecosystem services or value to human beings. [Coral reefs] protect shoreline, fish, and tourism. When we impact them in some way, it’s obviously taking away from diversity, but also from people’s livelihoods. Going back to your point about what is a coral reef, I think what’s interesting about them is how they grow. They grow much like a tree grows, putting down layer by layer by layer. What some climate scientists have done is taken cores out of coral reefs. Some of these things can live hundreds of years. They can look at growth rings and determine properties of the sea that then can be extrapolated to tell information about the climate. It’s a fascinating science looking at coral and looking at different sea level heights and temperature that have implications on coral reef growth. That gives indications of what the climate is like. Laurel Neme: Tell me more about ecosystem services and how coral reefs protect the shoreline. Kristian Teleki: Because of the structure of the reef [with its stone-like] construction, it’s like a pier almost, or piles of rocks. If a wave comes crashing into it the energy is absorbed by the reef. There is a very little amount of energy that is transferred beyond the reef. If you look at lagoons behind the reefs, often you’ll see in places with tourism, boats will anchor behind the reefs because the majority of energy of waves coming in is being absorbed, so there is calmer water behind the reef. Laurel Neme: And the people appreciate not being seasick! Kristian Teleki: It’s not going to protect from something from a tsunami. That’s a serious amount of water and energy coming through that’s going to overwhelm anything, as we know from recent experience with shoreline structures. But with storm waves and storm surges, [coral reefs] will protect the shoreline. If you think about what’s on a shoreline, often it’s communities. There is a significant amount of the world’s population that lives within 60 kilometers of the shoreline. It stops costal erosion. A healthy reef is growing, it’s alive, it can absorb the energy. But a reef that’s dying starts to erode; it becomes more fragile. If it breaks down, it won’t stop the energy from waves coming to the shoreline. Laurel Neme: And if they become more fragile, [pieces] start breaking off. Kristian Teleki: Exactly! In a place like the Maldives, for example, in the central Indian Ocean, there are low lying islands that depend highly on the coral reefs to absorb the waves that are coming in. The problem that the Maldives face, of course, is sea level rise. They’re already very concerned about being inundated with water. No longer are the coral reefs able to grow with the rate sea level rise is happening. You see pictures of places in the Pacific in the springtime, where at high tide there are people barbequing knee deep in water. That’s a regular occurrence in these areas. Laurel Neme: How many different species are there? How do they grow? Where do they grow? Do different corals require different habitats, like a certain salinity or temperature? Kristian Teleki: Generally speaking, the majority of them lie within the Tropic of Cancer and the Tropic of Capricorn. There are other areas where they lie outside of it due to particular oceanographic conditions. Coral reefs like warm, clear water because the algae in their tissue need to photosynthesize. Sunlight is very important. These conditions are quite narrow. If you change these conditions in any way, it stresses the coral reefs out. 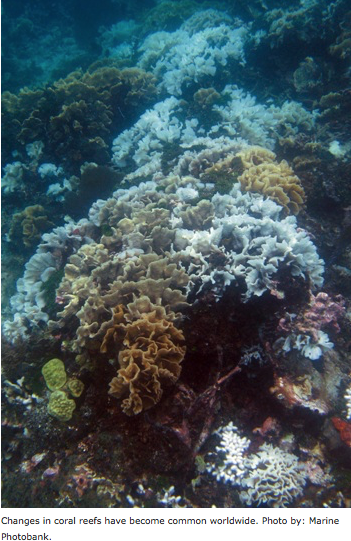 For example, in many parts of the world, over the last couple decades, we’ve seen a phenomenon called coral bleaching. Do you remember how I talked earlier about the algae that lives in the tissue? As a stress reaction to higher temperatures, the algae leave the tissue of the coral causing them to have a bleached appearance. So, corals are a very good indicator of changes going on in the environment. People often call coral reefs the canary in the coal mine. They have sensitivities to changes in their environment. Laurel Neme: If the algae leaves the tissue and you have coral bleaching, is there a way for the coral to feed and get its nutrients? Kristian Teleki: They can get some of their nutrients. There are some places in the world where bleaching is a regular event. In Thailand, bleaching seems to be a regular event. Corals do have the ability to recover. They have the ability to get some nutrients, but it’s not optimal for them. In 1998–this is a very good example–there was a mass bleaching event globally, but it particularly affected the [reefs in the] Indian Ocean. 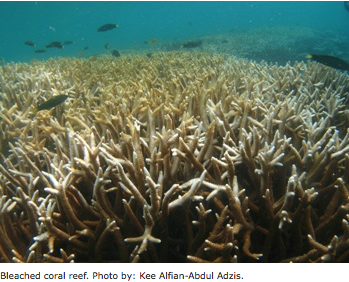 In some places up to 90% of corals died. This is what really put climate change and the impact of climate change on coral reefs on the map. No one ever thought they would ever see such a mass event. There’s a great story: I was going out to the Seychelles at one time and we arrived there at the peak bleaching event. I remember hearing some anecdotes from some of the dive operators there. [They were saying,] "This is fantastic! Look at how clean and white the corals look. It’s not dirty; it’s pure as snow." Sure enough, this particular event lasted so long that it caused a lot of the corals that were bleached to die. Suddenly they realized, "Wait a second. This is not as good as we thought." It caused them to learn a lot more about coral reefs, climate change, and the impact climate change can have on coral reefs. It’s just a really interesting example of how suddenly a wide swath of society around the world is taking interest in the impacts that global events can have on coral reefs. Laurel Neme: There are over 1,400 species of shallow water stony corals. Could you describe some of the different types of corals? Kristian Teleki: Corals are interesting in that the same species of coral that may have a boulder-type shape near the surface, at deeper depths may be more plate-like. What they’re doing is adapting to their light conditions. If you imagine a boulder and the sun shining down, only parts of those sides are going to get the light. If you flatten out in deeper waters, you can maximize the small amount of light that is getting to those depths. Corals themselves come in a range of different shapes. You have branching corals, plate-like corals, lettuce leaf corals, corals that look like clubbed fingers, corals that have a mushroom shape, and all of these different corals make up an entire reef. Laurel Neme: Do you find different types of corals in different conditions or geographic locations? Kristian Teleki: To give you a sense of what we’re talking about in terms of diversity, there are probably 60 to 70 species of coral [in the Caribbean] depending on where you make the cut. The center of coral biodiversity is in the Indo-Pacific, or the Coral Triangle, which is Indonesia, the Philippines, and Malaysia. That is the heart of coral reef diversity. [There are] over 600 species of corals in that area alone. Laurel Neme: That’s a huge difference. What about Hawaii? Kristian Teleki: Hawaii has quite a few species of coral, but it has a lot of endemic coral–corals that are unique to Hawaii because of its geographic location and isolation in the central Pacific. Laurel Neme: Do people harvest corals? Kristian Teleki: They do. 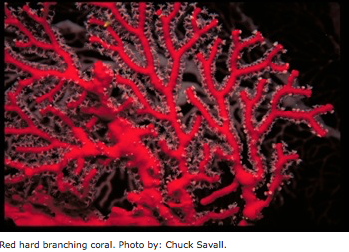 There’s a huge industry for harvesting corals in the aquarium trade, for example. People want live corals in their tanks. In some countries they do coral mining for limestone and the limestone is then made into cement. I’ll tell you some stories about these things because they’re quite interesting examples. I was once involved in a project in central Vietnam. It was about raising awareness amongst fishing communities. What was fantastic was there was a local cement company that was mining the reef. Once the local fishermen started making the connection between the reef, the fisheries, supporting their local livelihoods, and the importance of the reef for the reproduction of fish and fish abundance, they took it upon themselves as an act of civil disobedience to lie in front of the cement trucks to stop them from going to mine the corals. It was extreme. They stopped the cement company from mining the reef. It was just that little bit of making the connection between the reef, the abundance [of fish], and their livelihoods. They thought, "Hang on a second. We’re losing something here and we need to do something about it." 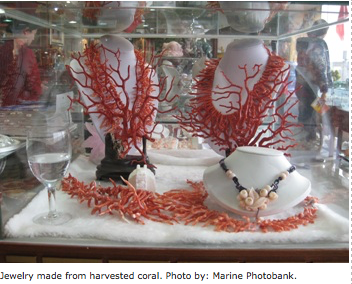 In terms of extracting coral reefs, there’s also been harvesting of coral reefs for the precious jewelry trade. There are some species of deep water coral, [corals that are] 100-feet in depth, that are being polished into jewelry. One particular family of corals, the red and pink corals, we estimate between 30 to 50 tons are being extracted out of the sea per year. That’s a lot of material being extracted. 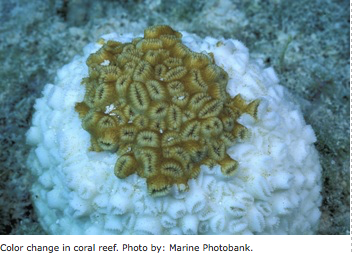 You also have individual corals that don’t necessarily form coral reefs as we know them. Those are spread throughout the world. That’s an ecosystem we know very little about. Then you have fishing trawling boats. Think about a plow or a farmer tilling his field. The effect that has as you draw that across a field–it basically lifts up and takes out any plant that is there. A trawling boat is dragging its net across the bottom and scooping up any sort of biodiversity that’s there. That’s happening around the world. We’re just starting to learn about the deepwater coral ecosystem. We’re finding out where it is and the importance that it plays. Likewise with the precious corals–the red, pink, and black corals–we know a little bit about their importance in the ecosystem, but we don’t know enough to say it can sustainably manage to have 30 to 50 tons taken from the sea. If you think about that further, it just underpins [the idea that] we know more about outer space than we do about out own ocean. Laurel Neme: I’ve heard a statistic that reefs are being degraded faster than data can be collected, and that less than 10% of an estimated 100-200 million reef species have been identified. Kristian Teleki: That’s true. I’ve heard that statistic for a long time. We’re just getting to know the reef. Even further, with the latest scientific techniques of genetic analysis, what was once thought to be a single species of algae that lived in the tissue of coral reef, it turns out there may be more that have the predisposition to different climatic conditions. That would then start to explain, for example, in the Persian Gulf, why you have corals that can withstand the extreme temperatures that occur there in the summer yet are managing to come back and survive. That’s raised a lot of interesting questions amongst the scientific community. If there is different diversity that occurs, are there particular areas that we should focus on, in terms of conservation effort, that may be able to withstand changes in sea surface temperature and changes to the ocean in the future? There are other things that live in the crevices and the cracks of coral reefs. I remember a colleague did some really interesting work. He took an endoscope that you’d usually use on human beings to go down the esophagus and look at the intestines. He took that same camera and starting pushing it into the cracks and crevices of the reef and found a whole range of different communities and interesting organisms and things that people had not seen before because it’s difficult to access that environment. There is definitely a lot more to be learned and discovered about coral reefs, without a doubt. Laurel Neme: I’ve also understood that some very important drugs have been developed from the chemicals found in the coral reef organisms, like AZT to treat HIV infections. Kristian Teleki: The pharmaceutical properties are limitless. There was a sponge that was found that had a significant anti-cancer agent. But one has to be very careful about the pharmaceutical argument in that there is bio-prospecting going on around the world. Bio-prospecting is not unlike a miner sitting in a stream sifting through samples of rocks looking for that little gold nugget. If you think about that in a marine context, you have institutions, organizations, and individuals sifting through all these samples looking for that unique property, looking for that little gold nugget. It’s a complicated business. It’s nothing that’s going to happen over night. But, like the rainforest that holds all sorts of interesting properties and medicinal value, we need to make sure we’re not undermining this by destroying the marine environment. [That same environment] may one day have that property, that particular pharmaceutical component, that’s going to be lifesaving for a sector of the population. Laurel Neme: What are some of the threats to coral reefs? We talked about them having a narrow band for survival, so global warming, I would assume, would be a huge threat because they’re so sensitive to changes in water temperature. Kristian Teleki: Exactly. Up until 10 to 20 years ago, the big things that were impacting coral reefs were more or less localized, such as pollution and sedimentation from a change in the landscape. If there was agriculture going on in a watershed up river, all of that stuff was washing down the river and into the sea and having an impact on the reefs by smothering them, making it too murky for them to photosynthesize and to live. There’s also been overfishing and destructive fishing practices, where you’re removing some of the key species. In some areas dynamite fishing is still going on. Laurel Neme: Can you describe dynamite fishing? Kristian Teleki: Dynamite fishing is a very destructive, easy way to fish. What one [will do], in many countries, is take some locally acquired chemicals, like fertilizers, put them into a plastic bottle with a fuse, light the fuse, throw it over the boat, and it goes into the water and explodes. It kills the fish and they all float to the surface. Then the fish are collected. It’s an easy way to fish. Of course, however, if you look at some of the blast areas, it decimates the coral as well. Not only are you removing the fish and all the other organisms there, but you’re also killing the corals. You destroy a three-dimensional, house-like structure. It’s flattened, not unlike what happens when a tornado comes through and mows down a house. The other practice, used by the aquarium trade, is cyanide fishing. Cyanide is injected into reef crevices. It stuns the fish. The fish are then collected, popped into bags, and they’re used for the aquarium trade. We hope that it’s a practice that’s not as prevalent as it used to be. Cyanide and coral reefs don’t mix. It’s particularly lethal for coral reefs. Laurel Neme: What about other threats? Kristian Teleki: If you look at natural impacts – hurricanes, big storms – [they] can have an impact. Those are things we have little control over. We’re starting to see an increase in coral diseases around the world. We don’t know if it’s some sort of pathogen coming from the land that’s made its way into the marine system. But, if you stress an animal, its immunity is going to be reduced and it’s going to be more vulnerable to diseases. I think that may be the same thing happening with coral reefs. They’re so stressed they can’t recover. They’re resiliency is not what it used to be. Laurel Neme: Tell me about recovery of coral reefs. How long does it take to grow? All of them seem to be slow-growing species. Kristian Teleki: Some are slow growing species; some are fast growing that can colonize quite quickly. It depends on if there is a suitable bottom for the coral larvae to settle on and grow. It depends on the right conditions [and whether you] reduce the pollution, the stressors, and the disturbances that are in the environment. Corals have been around for millions of years in one shape or form. They’ve gone through major environmental stresses in those time periods—changes in sea level rise, changes in salinity, and changes in global temperature. But the big, sixty-five thousand dollar question is whether coral can recover and adapt at the rate at which we’re changing the environment. That is the question we just can’t answer at the moment. Some corals have been found to recover quite quickly. In some areas, if you’ve reduced the pressures that are on them, some just don’t come back if there are pollutants or other stressors in the water that precludes them from any kind of recovery. What we’re trying to do in the scientific conservation world is to try to reduce those stressors, get people more educated about what makes coral reefs grow and thrive, and their importance, and how you can stop having impact from your activities and the things you do. There are a number of people out there that say, "Let’s have artificial reefs." That’s fine for a tourist attraction to try to get people to understand more about coral reefs and to get fish to gather around, but it doesn’t solve the large-scale coral health issue. Really it’s about trying to change behaviors and reduce the inputs that are coming into the sea because corals will recover given the right conditions. Laurel Neme: What can people do? Can you give me a top ten list? Kristian Teleki: There are a lot [of things people can do to help coral reefs]. I’ll look at it from the tourist perspective and then I’ll look at it from the local community/developing country perspective. From the tourist perspective, for someone who interacts with [coral reefs] or may go on holiday [to areas that have coral reefs, they should] be informed! Learn about this really unique ecosystem. It’s not rocket science when you start to learn a little bit about it. You don’t want to stand on it, you don’t want to collect it, you don’t want to buy any materials that are coming from the coral reef that support an activity that might have an effect on it. Think about the fish you buy; it should come from a sustainable source. There’s responsible snorkeling behavior and responsible scuba behavior. Ask the right sort of questions if you go on holiday as a tourist. There are probably other things we can do as a global community about climate change and reducing our carbon emissions. Laurel Neme: For tourists, is there a website or particular documents or groups that you would recommend that they check out to be able to learn more about what to do or how to act more responsibly? Kristian Teleki: There are a number of different organizations. I used to work with a group called the Coral Reef Alliance, who is based out of San Francisco. We did a number of information documents about responsible behavior around coral reefs, scuba diving, whale watching and turtle watching. They’re available in a number of different languages. It’s easy understanding dos and don’ts about interacting around coral reefs. 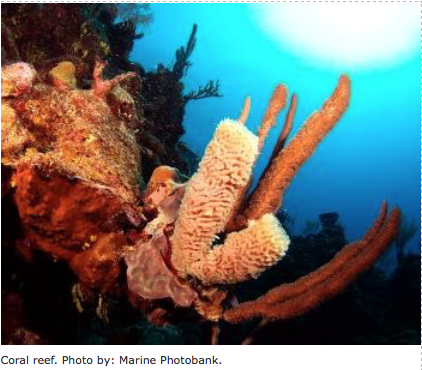 Laurel Neme: Legally, how are coral reefs protected or not protected? Kristian Teleki: That’s a very good question. It obviously varies from country to country in terms of their national regulation and coral reef policy. 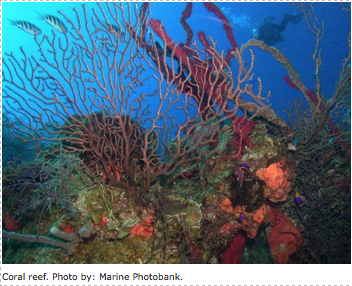 Marine protected areas are a good mechanism for protecting coral reefs. An example in the United States would be the Florida Keys Marine Sanctuary. It’s been very effective at making sure the Florida reefs are doing better than they were twenty years ago. There are international mechanisms. Some are not legally binding. The International Coral Reef Initiative is an initiative where governments and NGOs come together on a regular basis to talk about what are the most important coral reef issues. What are things we should be thinking about as governments, and are there particular issues we should be tackling? While it’s not legally binding, it does have informed processes, like the US government funding the coral reef crime scene investigation work that helps people collect the evidence when there has been damage done to a coral reef. There are other mechanisms like the Convention on International Trade for Endangered Species–CITES. The majority of corals, with the exception of a small handful, are listed on the CITES convention. There are different levels within this convention. The stony corals are on what’s called Appendix II. I won’t get into the jargon of it, but basically what it does is it provides a regulatory mechanism for the trade of coral reefs. If you want to export or import coral, it has to have a CITES permit. It tells you where it came from and is an assurance that it’s not just being hacked off the reef and being exported. It’s more of a regulatory mechanism, more control [and monitoring] of the trade…not a ban. 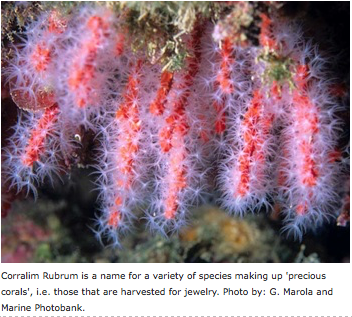 Laurel Neme: At the most recent CITES Conference of Parties meeting held in March 2010 in Doha, Qatar, there was a proposal to list red and pink coral under Appendix II. Can you tell me why that was necessary and what that proposal was? Kristian Teleki: SeaWeb was heavily involved in facilitating and convening conservation, industry and governments, and raising the importance of red and pink corals. They belong to a family called Coralliidae, and these corals are highly valued. They’re extracted from the sea, polished, and made into jewelry. There is a long history of this artisan craft in a number of countries around the world. In a recent period, over the last ten years or so, there has been a marked decline in some areas of the size of these colonies being extracted from the sea. At one stage they were maybe 50 centimeters high, now they’re on average 3 to 5 centimeters high in the Mediterranean. It’s easy to see there is obviously something going on. The artisan trade is now having to import [these corals] from the Pacific, and total global extraction [of red and pink corals] is between 30 to 50 tons [per year] of this material. [The CITES proposal was saying,] "Let’s not ban the trade, but let’s get a handle on it so we can be more responsible about putting some sustainability into it." SeaWeb worked with the jewelry industry to get them thinking [about alternatives]. There are other ways to derive inspiration around jewelry to create interesting pieces of jewelry, but not use the raw material itself. There were sectors of the industry that were vehemently against [the CITES proposal to list red and pink corals] to the extent that they were almost misinforming some of the people whose livelihoods were involved in the red coral trade and jewelry business. There concern was, "I want my nephew, I want my grandchildren, to continue in this trade that’s been in my family for hundreds of years." And I absolutely agree with that! That should be the case. But at the rate it’s being extracted, that’s not going to happen. We’re not talking about banning the trade. The idea of using CITES as a mechanism is to regulate it. Let’s get a better idea of what’s going on and where it’s coming from so better management measures can be put into place to truly make it sustainable over a long period of time. Laurel Neme: What happened with that proposal? It did not pass. Kristian Teleki: That’s right, it didn’t. Without trying to make this too political, it certainly became a very politically charged issue. Largely it was the lobbying efforts of a country that felt very strongly about it, that it didn’t need to be managed, that it was being managed fine at the national level. [That country] convinced a number of other countries to support their position. It was very unfortunate because it was largely based around misinformation that they were disseminating, [saying] that by implementing this, it would have a major effect on local livelihoods in developing countries. If you think about it, what we’re talking more about is, let’s find out what the trade is and find some more equity in the trade. A kilo, or two and a half pounds, of the red and pink coral goes for $1,500. 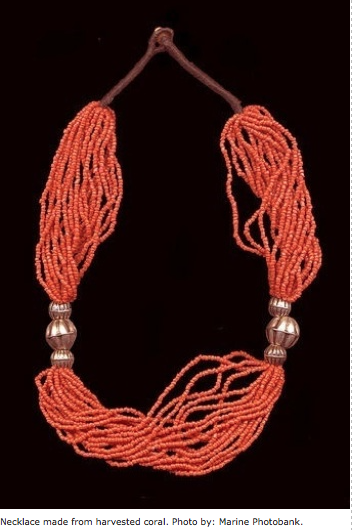 Some [jewelry] pieces are fetching up to $25,000. If the industry is making the $25,000 and the people fishing the coral are making only $1,500 for a kilo, I think it’s difficult to argue that livelihoods will be impacted because we’re talking about trying to balance it out across the board. It was very unfortunate that it was being treated as a fishery. These are not fish, they’re not mobile organisms. They’re in one location. There was a lot of confusion about how one might apply CITES. Laurel Neme: Yeah, it was a bad year for protection for a lot of marine species. Kristian Teleki: The marine species did not fair well. In fact, instead of calling it Doha we were calling it "No-ha." I think the conservation community is retreating and rethinking about what can be done to make CITES effective for marine species. It really has set us back considerably. We really can’t continue extracting at the rate we do blue fin tuna and sharks. More than 75 million sharks a year are being taken from the sea. 75 million! At the moment there are no mechanisms to protect them. We’re essentially shooting ourselves in the foot for any kind of future sustainability or future diversity within the marine environment. Laurel Neme: What makes protecting marine species so difficult? Kristian Teleki: I think there are a couple things. One, in the majority of countries around the world, although [they have] a coastline, I bet you’d find a majority of the populous has never even put their heads under water. When I give talks to groups, I often show a picture of deforestation of a rainforest and ask, "What’s going on here?" All hands go up and everyone says, "Yeah, that’s deforestation." I then show them a beautiful picture looking out to the sea and I ask, "What’s going on here?" Maybe a couple hands go up and they say overfishing. I say, "How do you know?" [The marine world] is out of sight, out of mind—and myths are still pervasive. While it is changing, the idea is still pervasive throughout society that the sea is bountiful and limitless—that it will absorb all the things we put towards it. It just is not! The statistics are there; the science is there showing there are fundamental changes to the environment. Conceptually, I think it’s difficult for a lot of people and policy makers to get their head around this three-dimensional, watery environment when they can’t see what’s happening below the waterline. I think that makes it difficult for them to connect to it. However, people are starting to connect more with the seas and to its sustainability. SeaWeb has been working with a number of different organizations and industries to improve their practices to make seafood more sustainable. We’re raising awareness with the general public. Once the general public has raised its awareness, then they can start asking hard questions to the people they elect—Why is there no protection? Why are there no fish in the sea? What should we be doing now? What are you doing about it? What is the government doing about it?—and pressing [the issue]. Until that time, when people really start thinking about the importance that oceans play, it’s going to be a very uphill battle. I don’t want to paint such a gloomy picture. I think there is a lot of hope. There are a lot of small success stories out there about people coming together to make the marine environment a better place. There is some increasing concern about it, but let’s not wait for it to be a real problem affecting everybody. I think we can do something about it now.